Join the American Hosta Society and receive The Hosta Journal mailed twice a year and have access to a third issue online in the Members Only section of the AHS website. This publication offers the latest information on care, feeding, and hybridizing; pictures of new cultivars; and news of upcoming meetings and conventions. (See "Sample Article"). An opportunity to attend national meetings and conventions which offer educational and scientific presentations, garden tours, judge's clinics, and a chance to see the latest and best hosta in the hosta show. 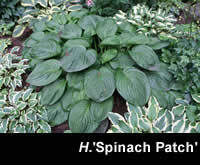 Developing friendships with people who share an interest in growing hostas. see a list of participating vendors here! Late Renewal Notice - In order to attempt to reduce the current practice of late renewals and offset the cost of mailings to late renewals, a $5.00 fee will be added to all membership renewals postmarked or paid online after midnight EST on March 17, 2019. Regional Societies have their own membership, activities, and publications. Visit the Local Societies section for more details.